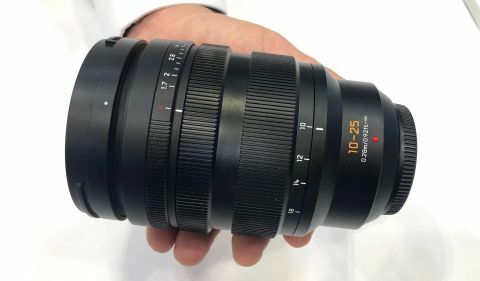 We first heard of this lens back at Photokina last year, but back then this felt like a designers dream rather something that we could get our hands on. Fast forward to The Photography Show, and we have been able to get our mitts on what most be one of the most remarkable lenses to be launched in recent years. This Micro Four Thirds lens, as is usual for the top models in Panasonic's lens line-up, bears the Leica name. But what really makes this lens special is the maximum aperture - which is a constant f/1.7 throughout its 10-25mm range. We don't know when this lens will come to market, or what price it will sell at - however the prototype that we were given to play with was said to be a realistic version of what will actually go on sale. With the MFT crop factor, the effective focal length range is equivalent to a 20-50mm – putting this lens firmly in the standard zoom category. The first thing that you notice about this lens is its weight – or rather the lack of it. As you can see from the pictures this looks a significantly large lens, which is not surprising given its ultra wide maximum aperture. But this is much lighter that you would expect when you pick it up, and this felt perfectly balanced on the Panasonic Lumix G9 that we tried it out on. The front element of the zoom takes a 77mm filter ring – which helps give you a sense of the size of the lens. But the next surprise on this camera is the aperture ring. Not just that there is a manual aperture ring - but that adjustments across the range are completely stepless, from f/1.7 through to the minimum setting of f/22. This will be of particular appeal to video shooters – such as those using the Panasonic GH5 or GH5s mirrorless models that are a favorite amongst filmmakers. In between the aperture ring and the zoom ring is a super-smooth manual focus ring – which will also be of particular joy to videomakers who have to pull focus during a live recording. The lens does also, thankfully, also offer autofocus - and this appeared fast and accurate (which is perhaps not surprising due to the brightness which is achievable with the lens wide open). Sadly we don't have the full specs for the lens as yet – although we could at least see that the maximum aperture of the lens is a very respectable 0.28m. Price and availability have yet to announced - but with a prototype now out in the wild for the public to play with, a full-production version will hopefully be with us in the not to distant future.